김홍도필 는 중국 송대(宋代) 구양수(歐陽修, 1007∼1072)가 지은 ‘추성부(秋聲賦)’를 단원 김홍도(1745∼1806? )가 그림으로 그려낸 시의도(詩意圖)이다. 화면의 왼쪽에는 백문타원인(白文楕圓印)으로 기우유자(騎牛游子)라 찍혀 있으며 추성부 전문이 김홍도의 자필로 쓰여져 있는데, 끝 부분에 ‘을축년동지후삼일(乙丑年冬至後三日) 단구사(丹邱寫)’라 하였으므로 이 그림은 1805년 즉, 단원의 나이 61세에 제작된 것임을 알 수 있다. 그런데 이 해는 단원이 죽기 바로 전 해로 추정되므로 그의 마지막 기년작이자 죽음을 앞두고 그린 작품으로 믿어진다. 화면의 오른쪽에는 메마른 가을 산이 그려져 있고, 산 능선 위로는 수평방향의 갈필로 음양을 주어 밤 중임이 시사되어 있다. 중앙에는 중국식 초옥(草屋)이 있으며 둥근 창 안에는 구양수가 보인다. 이 그림은 구양수가 책을 읽다 소리가 나자 동자에게 무슨 소리인지 나가서 살피라 했고, 이에 밖으로 나간 동자는 ‘별과 달이 환히 빛날 뿐 사방에 인적은 없고 소리는 나무 사이에서 납니다(성월교결(星月皎潔) 명하재천(明下在天) 사무인성(四無人聲) 성재수간(聲在樹間))’라고 답했다는 바로 그 장면을 그려낸 것이다. 동자는 손을 들어 바람소리 나는 쪽을 가리키고 있으며, 집에서 기르는 학 두 마리는 목을 빼고 입을 벌려 그 바람소리에 화답하듯 묘사되어 있다. 또 마당의 낙엽수들은 왼쪽에서 불어오는 바람에 흔들리고 바닥에는 떨어진 낙엽들이 드문드문 흩날리고 있다. 화면 왼쪽 언덕에는 나무가 두 그루 서 있고, 그 옆쪽에는 대나무에 둘러싸인 초가집이 보이며 위로는 보름달이 떠 있다. 이 그림은 전체적으로 어둡게 시채되어 있으며 갈필을 사용하여 가을밤의 스산한 분위기가 잘 드러나 있다. 좌우에 산이나 언덕을 배치하여 초옥과 마당을 감싸듯, 부감하듯 그려냄으로써 주제를 강조하는 포치방식은 역시 구도에 대한 단원의 뛰어난 감각을 단적으로 말해주며, 호리호리하면서도 불규칙하게 꺾여 올라가 끝이 갈라지는 나무 형태 또한 단원의 전형적인 화법을 보여준다. 왼쪽에서부터 오른쪽으로 약간 비비듯이 처리된 메마른 붓질들은 차가운 달빛 속에서 거칠고 황량한 나뭇가지 사이로 불어오는 매서운 바람소리를 효과적으로 전달해 내고 있다. 그것은 곧 구양수가 전하고자 했던 노년의 비애이자 또한 동시에 죽음을 앞 둔 단원의 심회의 형상화이기도 할 것이다. 구양수가 만물이 조락하는 가을을 맞아 인생의 허무함을 탄식하는 ‘백가지 근심을 마음에 느껴(백우감기심(百憂感其心))’라는 구절은 바로 단원이 1805년 김생원이라는 이에게 보낸 편지 속에서도 인용했던 구절로서 단원의 당시 심적 상태를 여실히 반영해 준다. 아픈 몸에다 아직은 어린 외아들 김양익의 장래문제, 출가한 딸에 대한 걱정 등이 겹쳐 단원 역시 인생의 허무함에 절로 탄식할 수 밖에 없었을 것이다. This is a painting made by Kim Hong-do (1745-1806/pen-name: Danwon) portraying the scene in a poem titled Chuseongbu (Sounds of Autumn) composed by Ou Yangxiu (1007-1072) of the Song Dynasty of China. The entire content of said poem is written on the painting in the painter’s hand. The information provided in the piece says that it was made in 1805 when the painter was 61 years old. He is said to have passed away in 1806. 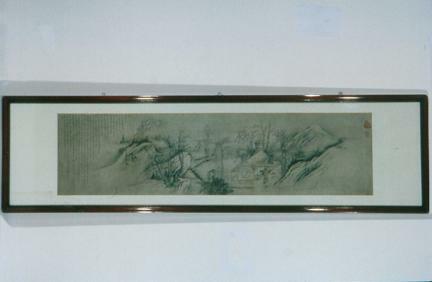 The right side of the canvas portrays an autumn mountain. The light and shade depicted in the background indicate that it is night. A scholar is seen sitting in a thatched Chinese house at the center through a large, round window. This scene portrays a line in said poem, which reads, “Only the moon and stars are shining brightly, sir. I can find no trace of a person. The noise is made by the swaying of tree branches”; this is the reply of an errand boy in response to his master’s instruction to check what was happening outside after the master hears some noise while reading a book in his room. The picture shows the errand boy pointing to the place where the noise was made by the wind. Two cranes raise their heads, honking as if they were frightened by the noise. Fallen leaves are here and there on the courtyard. The moon is in the sky. Overall, the piece depicts a dreary atmosphere of a fall night. The hills and mountains on the right and left look as if they are embracing the house. The piece shows the painter’s outstanding sense of composition. The thin trees and their irregularly forked twigs are also a scene that frequently appears in the painter’s pieces. In the painting, one can feel the sound of wind blowing through tree twigs under the cold moonlight on a fall night. Perhaps, that was the dreary feeling sensed by the poet and shared by the painter in their later years. The line “my mind is filled with a hundred worries,” expressed by the poet regarding the evanescence of life, was quoted by Kim Hong-do in his letter sent to a person identified only as Kim, showing how he felt at that time. At that time, he was suffering from poor health. Besides, he was concerned about the future of his only son, who was still young, and about his married daughter.